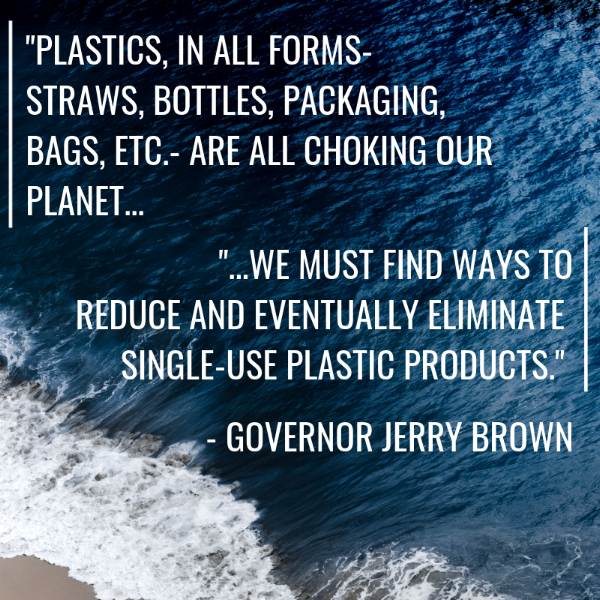 SACRAMENTO— California Governor Jerry Brown today signed four key bills and made his boldest statement to date on the public health and environmental threat posed by plastic pollution and waste. AB 1884 (Calderon, Bloom) requires restaurants to offer straws only upon request. SB 1335 (Allen) requires reusable, recyclable, or compostable takeout food packaging at state facilities, including parks, beaches, colleges, and fairgrounds. SB 1263 (Portantino) directs the California Ocean Protection Council to develop a Statewide Microplastics Strategy. SB 1422 (Portantino) requires drinking water to be tested for microplastic pollution, and for results to be disclosed to the public. Adhering to the California waste hierarchy by targeting source reduction, AB 1884 (Calderon, Bloom) would transition sit-down restaurants to a straws upon request policy. “By removing the default behavior of providing straws with every drink, consumers have an opportunity to make a deliberate, small change that will minimize the harmful impacts of single use plastic straws in the environment. It’s a small but significant step forward and will hopefully set the precedent for the rest of the nation to adopt similar policies that will ensure less plastic ends up harming the environment,” said Assembly Majority Leader Ian Calderon. SB 1335 (Allen) phases out takeout food packaging that is not widely recycled or composted, has toxic ingredients, makes up a significant portion of pollution in public spaces, or substantial negative impacts on wildlife from being used at state facilities, including state parks, beaches, colleges, office buildings, and fairgrounds. "EPS foam take-out food packaging and food wrappers are some of the worst offenders at beach cleanups, accounting for over 20% of items picked up at California’s Coastal Cleanup Day in 2017,” said Shannon Waters, Healthy Beaches Manager at Surfrider Foundation. “We commend Senator Allen for his leadership authoring SB 1335. It's a win for all of California to enact legislation like this that will help prevent trash from reaching our ocean and beaches." Melissa Aguayo, Advocacy and Education Director with The 5 Gyres Institute commented on SB 1335’s passage, "Eight of the top thirteen worst plastic product offenders on our Better Alternatives Now (BAN) List 2.0 are tied to take-out. Our on-the-go lifestyle leads to more eating out than ever, the plastic is piling up and it comes with a high cost to our health, marine life, communities and ocean….Something that is used for minutes should not be made with a material that was made to last forever. " SB 1263 (Portantino) would require the Ocean Protection Council to adopt and implement a statewide microplastics strategy. In 2016, California voted to become the first state in the nation to ban single use plastic grocery bags. Data from statewide beach clean ups show that policy is already delivering results in terms of reduced pollution and waste. Governor Brown has until September 30 to sign or veto remaining bills sent to him by the Legislature. Updated on 9/28/18 to reflect the signing of SB 1422.